Thinking about our personal wellbeing and taking action to ensure it is in a good place is becoming increasingly more challenging as we deal with increased levels of pressure, change and an ‘always on’ culture. The more I work with individuals helping them to be of their best, it is becoming increasingly clear that the route to success is developing regular positive habits to sustain our wellbeing, not fix it when we feel it’s not as we like it to be. I often get individuals coming to work with who are ‘out of sorts’ ‘feel low’ generally aren’t sure what it is but they know they aren’t right and generally don’t feel as good as they have previously. After exploring what’s going on for them it becomes clear which aspects of their wellbeing are out of sync and would benefit from them working on. Great they think I know what to do to ‘fix’ the problem. We like fixing problems, it gives us a sense of achievement – a key element to wellbeing. 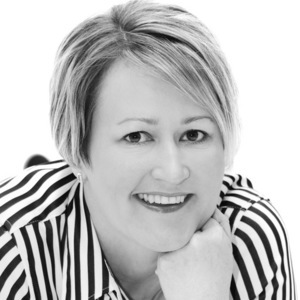 What happens though is that we forget about it once we think we’ve fixed it and go back to our normal way of being, not focusing on our wellbeing as we are too busy and any way its fixed now so I’ll be ok.
I’ve had many clients that have returned to me, again feeling out of sorts – Julie can you help me fix it again. I usually identify that all those great things they did when we had previously worked together have slipped by the wayside and are no longer part of their regular habits. I know from personal experience that if I hadn’t cycled for a while or connected with nature in someway for a while then my wellbeing would dip, also not being clear on my purpose and how I was doing things that connected with this also has a negative impact on my wellbeing. 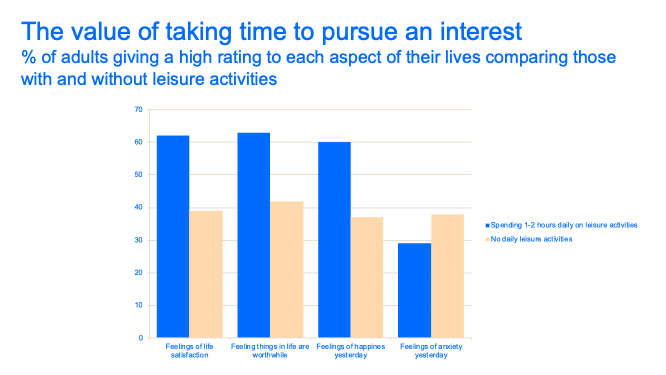 I’ve recently been doing some work with the Art Fund and they commissioned some research last year exploring the impact of regularly taking time out for ourselves and how would impact on our psychological wellbeing. How do you think taking regular time to pursue and interest has on our wellbeing? You can see from this graph that those people who did spend time daily on leisure activities had increased; feelings of life satisfaction, feeling things in life are worthwhile, increased feeling of happiness and reduced levels of anxiety. When we say leisure activities we don’t mean watching endless television or being constantly connected to the digital world. What the research also did was get people to visit museums and or galleries more regularly, can you remember when did you last visited a gallery or museum and how did you feel after attending? I sometimes sneak a visit in when I’m in between clients when I feel I need some down time, a place to escape and switch off, or it may be when I’m having a problem that I can’t seem to solve, taking some time away from it and connecting with something else for a while often helps me access a solution. The visit refreshes me in a calming way and I always feel great having been, taking time to explore and learn or see something new. So, I wasn’t surprised when I saw what their participants had said about their visits. Those that visited at least once a month had increased levels of life satisfaction, sense of purpose and happiness. Visiting a gallery or museum isn’t the only thing that you could to support your wellbeing, the key aspect is the taking time regularly to do things that will have a positive impact on your wellbeing, maintaining it rather than fixing it when you aren’t feeling good. 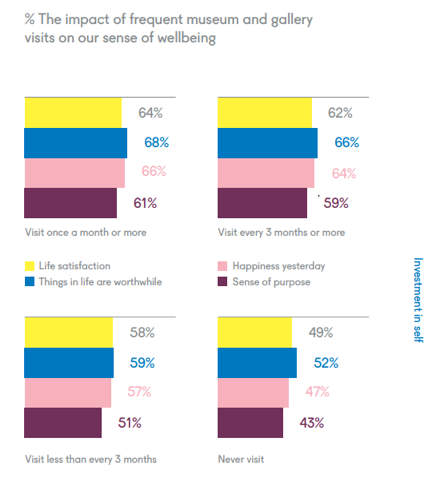 So why did the visits have such a great impact on the participants wellbeing? For this it is useful to understand a wellbeing model which look beyond the ‘I feel happy’ aspects of wellbeing. The one I tend to work with when supporting clients is the PERMAV model devised by Martin Seligman. E – Engagement, engaged in what you are doing, focused, in flow. R –Relationships, that are mutually supportive, empathetic, affectionate, intimate. M – Meaning, doing things that you feel are purposeful and have meaning to you. V – Vitality, noticing and managing your energy and for me energy has 4 areas; physical, emotional, cognitive and spiritual – more about this in a future article. So how does visiting a museum or gallery regularly link to this model of wellbeing? The participants reported that they had enjoyed the visits, it had lifted their spirits made them feel good. They had lost track of time when visiting, being fully engaged in their visit. Some had gone with others which had enabled them to spend time with others that are important to them. The visit felt meaningful and also gave them a sense of achievement having planned the visit and then been successful in visiting. It helped raise their energy levels on a number of levels taking that time out for themselves, taking time away from the normal everyday challenges. As I mentioned at the beginning the important aspect for managing your wellbeing is being purposeful about it, not leaving it to chance, develop regular positive routines that support you. I know it’s not easy and I am still working on it myself. I now do yoga on a Monday evening, art class on a Thursday, I work my gym visits around my diary challenges, I plan connections with my friends and get them booked in the diary. This year I was bought a National Trust Card and am planning visits to explore new places with my husband at weekends. I do visit galleries and having read the research in full am now planning more visits along with my goal this year to increase my meditation from being a fix it approach to one of maintenance. Enjoy maintaining not fixing so you can consistently achieve high levels of wellbeing and be of your best. Sage advice which I shall endeavour to put into action. Great work, thank you.